To Cite: Naseri L, Mohamadi J, Sayehmiri K, Azizpoor Y. Perceived Social Support, Self-Esteem, and Internet Addiction Among Students of Al-Zahra University, Tehran, Iran, Iran J Psychiatry Behav Sci. 2015 ; 9(3):e421. doi: 10.17795/ijpbs-421. Background: Internet addiction is a global phenomenon that causes serious problems in mental health and social communication. Students form a vulnerable group, since they have free, easy, and daily access to the internet. Objectives: The current study aimed to investigate perceived social support, self-esteem, and internet addiction among Al-Zahra University students. Materials and Methods: In the current descriptive research, the statistical sample consisted of 101 female students residing at AL-Zahra University dormitory, Tehran, Iran. Participants were randomly selected and their identities were classified. Then, they completed the Multidimensional Scale of Perceived Social Support, Rosenberg’s Self-esteem Scale, and Yang Internet Addiction Test. After completion of the questionnaires, the data were analyzed using the correlation test and stepwise regression. Results: The Pearson correlation coefficient indicated significant relationships between self-esteem and internet addiction (P < 0.05, r = -0.345), perceived social support (r = 0.224, P < 0.05), and the subscale of family (r = 0.311, P < 0.05). The findings also demonstrated a significant relationship between internet addiction and perceived social support (r = -0.332, P < 0.05), the subscale of family (P < 0.05, r = -0.402), and the other subscales (P < 0.05, r = -0.287). Results of the stepwise regression showed that the scale of internet addiction and the family subscale were predicative variables for self-esteem (r = 0.137, P < 0.01, F2, 96 = 77.7). Conclusions: Findings of the current study showed that persons with low self-esteem were more vulnerable to internet addiction. Copyright © 2015, Mazandaran University of Medical Sciences.This is an open-access article distributed under the terms of the Creative Commons Attribution-NonCommercial 4.0 International License (http://creativecommons.org/licenses/by-nc/4.0/) which permits copy and redistribute the material just in noncommercial usages, provided the original work is properly cited. Internet addiction disorder (IAD) is defined as one’s inability to control his internet using, which could lead to physical, psychological, and social difficulties (1). Internet use is recognized as an essential part of the modern life. Owing to web-based technologies and increased internet access in Latin America and Asia, use of internet has dramatically increased across the world, with the global number of internet users reaching more than 2.3 billion in 2011 (2). Internet provides many positive benefits to users as it allows them to obtain new information, knowledge, and even entertainment. However, it also causes many problems. Its explosive growth in the last decade had a huge impact on communication and interpersonal behavior. Internet was originally designed to facilitate communication and research activities, but the dramatic increase in its use in recent years has led to pathological use (3, 4). Today, internet addiction is discussed as a psychological disorder in psychology and medical sciences. Clinical specialists have reported cases of this disorder observed in their clinics. As a new form of addiction in recent years, it has attracted the attention of researchers in psychology, psychiatry, sociology, and other scientific fields (5). In his research, Yang found that internet addiction has seven main reasons: insecurity, financial problems, marital discontent, work stress, anxiety, family disputes, and limited social life (6). Griffiths defined internet addiction as a non-chemical addiction originating from interactions between human and machines and added that technological addiction is either passive (television) or active (computer games), prompting and reinforcing the characteristics facilitating addictive tendencies (4). Internet addiction is accompanied by several psychological problems, including self-doubt, anxiety, and depression (7). Perceived social support is defined as a mental sense of belonging, acceptance, and being loved by others; thus, it can foster secure relationships for a person. Theorists believe that perceived social support, as a comparative source, can decrease the harmful effects of stressful factors in one’s environment (8). It is believed that the social support of friends, family, and others decreases psychological stress in people. Shaikhalizade et al. (9), Cohen and Sayme (1985), Vex (1998), and Sarasoon (1990) referred to the major point that decreasing social support increases the vulnerability of physical and mental structures. Concurrent with many studies worldwide, a few researches are conducted in Iran (10). It was found that because of internet addiction, students had weaker social relations and weaker mental health; they preferred using internet to having social relationship with their friends, family, spouse and other people. The current research aimed to investigate comprehensive social support, self-esteem, and internet addiction among university students. Cluster sampling was employed to select participants; subjects completed the multidimensional scale of perceived social support, Rosenberg self-esteem scale, and Yang internet addiction tests. Perceived social support (Mspss) is a measurement with 12 items provided by Smith et al. to evaluate perceived social support from three resources: family, friends, and effective persons around us. This scale measures perceived social support by examining these three areas. It has three subscales: family (items 3, 4, 8, and 11), friends (items 6, 7, 9, and 12), and others (items 1, 2, 5, and 10). This scale has a desirable internal consistency. The total alpha coefficient of test is 0.91, and the alpha coefficient of its subscales ranges from 0.90 to 0.95. This scale has good construct validity, because it has no correlation with the social goodness scale of Marlow-Kron. A high score in this scale shows that there is high level of perceived social support (11). In the Iranian subjects, perceived social support values for family, friends, and others were 89%, 86%, and 82%, respectively (12). 20 - 49 points indicates an average online user. The user may surf the web a bit too long at times, but has control over usage; 50 - 79 points indicates the user is experiencing occasional or frequent problems because of internet, and its full impact on the user’s life should be considered; 80 - 100 points indicates the user’s internet usage is causing significant problems in his/her life. Its impact should be alleviated, and the problem caused by internet usage should be directly addressed (13). The Rosenberg self-esteem scale is a 10-item, self-report measure of global self-esteem. It consists of 10 statements related to overall feelings of self-worth or self-acceptance. The items are ranked on four-point scales ranging from strongly agree to strongly disagree. Among the Iranian subjects, the coefficient of internal consistency in the whole subjects was 0.84 (14). After completion of the questionnaires, the data were analyzed by correlation and multiple regression analysis tests using SPSS version 21. According to the descriptive statistics, about 22.8% and 77.2% of the subjects had high low levels of self-esteem, respectively. 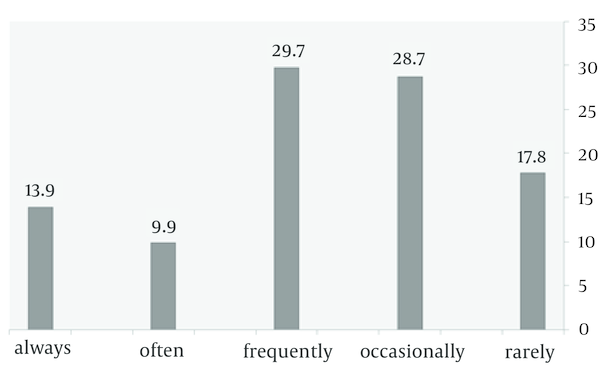 Results of the descriptive statistics based on Table 1 and Figure 1 showed that, based on answers to question 1, 29.7%, 9.9%, and 13.9% of the subjects said that they frequently, often, and always used internet more than they intended, respectively. 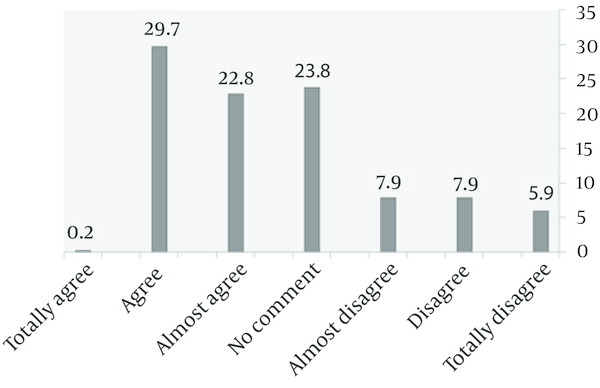 Results of the descriptive statistics showed that, based on answers to question four concerning effective support by family or friends, 29.7% believe that they enjoyed family support, and 23.8% enjoyed friends support (Figure 2). Results of the stepwise regression test showed that the scale of internet addiction and the subscale of family were predicative variables for self-esteem (r = 0.137, P < 0.005, F2, 96 = 77.7). The regression model showed that it could be possible to predict one’s self-esteem score by the internet addiction scale and family subscale (Y = 3.66 - 0.085 Ait + 0.734 family). Scale of perceived social support includes the subscales of family, friends, and others (Tables 2 and 3). a Scale of perceived social support includes the subscales of family, friends, and others. The current research investigated perceived social support, self-esteem, and internet addiction among university students. The findings demonstrated that persons with low self-esteem were more vulnerable to internet addiction than the ones with high self-esteem. This result conforms to those of the previous studies (7, 13). According to the previous studies, addicted users had low self-esteem (Yang and Tony; Kaplan, Great and Benyard). To explain these results, Davis’s theoretical model (15) can be used. Based on his model, low self-esteem as a psychological damage could predispose a person to becoming an internet-addicted user. Results of the current study showed a significant correlation between addiction to internet and perceived social support, the subscales of family, and others. This result is in conformity with those of the previous studies (16). A study found that addicted students had low social relationships; internet addiction may lead to weaker social, personal, familial, and friendly relationships in university students. Studies by Yu et al. (17) indicated that strengthening familial relationships and promoting youth positive development could prevent internet addiction in adolescents. Patients with internet addiction have more anxieties as well as prominent disruption in familial relationships (18). Kim et al. (16) in his studies found that the levels of depression and suicide were the highest in the internet-addicted people. The findings of study by Tang et al. (19) indicated a high prevalence of internet addiction among Chinese adolescent internet users. The study highlighted the importance of stressors in interpersonal and school-related problems, which are mainly mediated with a negative coping style, as risk factors for internet addiction (19). Kaplan’s studies showed that internet-addicted persons have low levels of social relationships compared with others (20). Alavi et al. (13) showed that internet usage, in spite of creating a figurative space for relationships with others, is unable to create relationships with friends and family. Davis’ theoretical model can explain these results. Based on this model, loneliness due to social isolationism or lack of social support, prepares a person to become addicted to internet (15). The findings of several studies on internet addiction also showed that persons who have low self-esteem or social skills are exposed to internet addiction more than others; they look for their identity or ranking in the figurative space of internet. However, it cannot be concluded that people with low self-esteem have the inclination to use internet or that internet abuse may led to weaker social relationships and create loneliness in a person, eventually causing depression or low self-esteem. Based on the previously discussed problems concerning internet usage addiction, it is necessary to provide instruction for proper use of this technology, especially to universities and students as national assets for development. Due to the availability of wireless technology at Al-Zahra University, study subjects were selected from the students of this university. Unfortunately, since it is an all-female university, all participants were female. It is recommended that future studies compare the internet addiction among females and males. Furthermore, it is recommended to study the relationships between internet addiction, depression factors, perceived social support, and self-esteem in males. Authors’ Contributions: Laila Naseri designed and conducted the study. Jalal Mohamadi collected data; Koroush Sayehmiri performed the statistical analysis, Yosra Azizpoor improved the writing quality of the article. All authors read and approved the final manuscript. 4. precursors of the internet addiction among adults? the impact of self-concept stress and Internet usage control on the internet. 9th Asia-Pacific Decision Sciences Institute Conference. 9. The survey effect of family and friends social support on mental health Shahed and non shahed students in University of tarbiat Moallem Azarbijan. The first national conference family-student.